One historic incident in the lively, rich history of our country has never been as deeply scrutinized, debated over, and pondered like the infamous O.K. Corral gun fight that occurred in October, 1881, in Tombstone, Arizona. This gunfight, and this city that is arrayed in legends and sordid Hollywood grit and glitz has endured through countless films, including the well-known film Tombstone from the nineties, and the more campy classic films representing the characters from this town in western films in the fifties and sixties. Westerns have always steadfastly held our cultural fascination, though we’ve always been more enthralled with a moral scheme of westerns that has an unrealistic paradigm containing strict definitions of what behaviors or roles in that Western context or scheme constitute “morally good” behavior, or “morally bad” behavior. These dull, tightly-defined moral standards are thrown to the wayside, once Mary Doria Russell-author of the postmodern scifi epic The Sparrow-offers her own take on the forces that conspired in this town to unwittingly create one of the widely-debated gun battles seen in that decade. The literary phase of post-modernism (a period we are entering the latter period of) has allowed for writers to be more earnestly skeptical about these things, and allow characters to have more moral nuances, or just generally be accorded more flexibility in terms of their actions in the story. Now that is not entirely fair to literary works in the past, which do have fairly complex figures, but they are almost always still strictly entrenched still within certain trope molds. Take for instance, the age-old trope of the classic hero that was demonstrably heroic and powerful, like that of Achilles, from Homer’s Iliad,whose heroic feats of strength and military prowess were almost always as being purely heroic, unquestionably right. Of course, many literary critics and students analyze these works through modern lenses, and anachronistically apply more moral complexities or shades of grey to the actions of certain characters in these tales. Since Mary Doria Russell’s pays homage to Homer’s Illiad, the book actively responds to the mythical tropes that has pervaded works, trying to provide an engaging narrative for this historical narrative that has quite literally entered the stratosphere of our collective mythic imagination. And the battle of O.K. Corral is very much layered in mythic archetypes, in that certain figures like Wyatt Earp and even Doc Holliday have their characters sanitized and reduced to mythic archetypes and caricatures to fit that classic scheme of a Western. These characters have their own paradoxical personalities in this work, and Mary Doria Russell allows them to exist as dimensional, fascinating characters, versus mere mythical archetypes, in an effort to redress the cloying fog of romanticism that clouds such an important historical, defining event like this battle. All these characters were fully-breathing, active human beings at a fixed time in our nation’s past, and they deserve to be freed from their cobwebbed elegiacal past. This story was a means to act as a recourse against that cloud of romanticism, and Mary Doria Russell adeptly gives such noteworthy historical figures like Josephine, the Earp brothers, Ike, Doc Holliday, and countless others their own distinct, rich personality, replete with such astonishing complexity, that this book really does magically transport you, through a quasi-book-bound time machine (think of the book being your own personalized Tardis that transports you to late nineteenth Century Arizona), into a vaguely familiar past, which feels much more realistic than ever. More important,This story doesn’t cheaply herald any act of violence as being falsely heroic, rather it provokingly presents violence as a desperate measure, where one human being recklessly seeks control over their environment. And Mary Doria Russell echoes this disruption, occurring both extrinsically and intrinsically, in the minds of those who are involved in the final fight, and the consequent acts of vengeance/revenge that follow afterward. These characters become depraved and damaged by the violence, no matter what side they’re on. In the Iliad, while the Greeks may have had adulation for the heroic feats of Achilles, the end of the poem offers a sobering meditation on the lives lost, and the general toll that the battle had taken for both sides of the war that erupted. When the dust settles in the middle of the O.K. Corral gunfight, there is never a true victor, but there is almost always many individuals, affected in a deleterious way by the violence they partook in. Don’t get the message that this work is an anti-violence polemic of any sort, this is a complex story that offers many things for the reader to individually process and tackle. That is the mark of a true work of literature, in that events like this can be relived through the minds of the reader, in such a way that it comes close to depicting the true vertigo sensation that we all feel whenever surrounded with the dizzying depths of complexity that all human events contain. Impressively, Epitaph’s pacing and sense of subtly-described realism never suffers from either dry writing, flat characters, or uninspired prose that could easily have made the figure of Wyatt Earp and other principal characters of this story return to their uninteresting, flat, Western tv series selves. Instead, we are left to ponder a myriad number of very important questions about the characters, and the various decisions that they made to contribute,either consciously or unconsciously, to the final blowout gun fight that explodes in a town has been long on the brink of some kind of disaster. The O.K. Corral gunfight may have been a transient event in time, but the preceding factors or events that contributed to this one single eruption of violence were comprised of a heterogeneous combination of political tensions, personal vendettas, and many other factors that always belie the simplicity of any fixed event in time. This is the genius of this work, in that it doesn’t just linearly paint these events as a mythical afterthought, but instead cements it as real, definitive history that had a very large impact on that area of Arizona at that time and the way the American West expanded from that point onwards, and the way we later artificially recaptured it in our films, tv shows, or flash fiction stories. 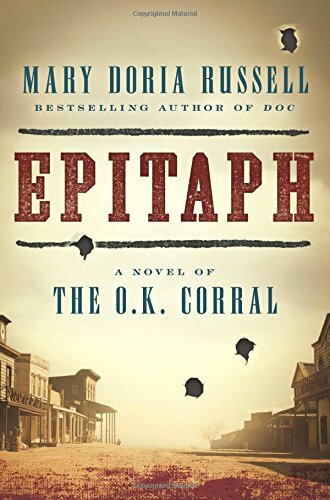 Mary Doris Russell has done a great service to this iconic event in our country’s history, and I have never been more fascinated by the individuals who were directly involved with this event, and the true gritty, complex history of the American West at this time, especially after reading this fantastic book. Any serious fans of well-written historical fiction, like myself, will want to be sure to check out this title! It is definitely a strong contender for my favorite book thus far of 2015 (and there is already stiff competition!). With its intoxicating strong smell, dark tint (after its been steeped for a good 3 or four minutes), this amazingly delicious Early Grey blend- one of my personal favorites- from local tea/coffee company Cafe Excellence in Audubon PA comes highly recommended as an accompanying beverage for any planned reading of Epitaph. Earl Grey is one of my personal favorites, definitely an acquired taste due to the divisive Bergamot added to the tea that either makes or breaks this tea for so many drinkers. MajaTei’s Earl Grey Tea contains no artificial flavoring, like a certain overrated Teavana Earl Grey blend which contains artificial flavoring as a disappointing substitute for real, substantial Bergamot. You can taste slight hints of cream and tangy orange flavors as this tea invade your tastebuds, when you first sip this tea. But none of these things, along with the requisite Real Italian Bergamot ,used in this tea is overpowering, in any way that can easily render an Earl Grey blend to the rank of being inedible and tart. 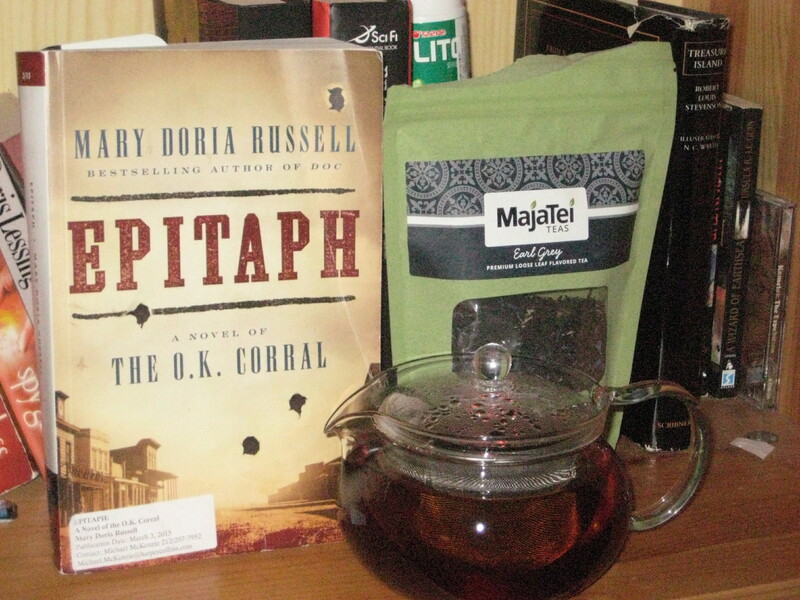 Earl Grey Teas are analogous to historical fiction novels, like Mary Doria Russell’s Epiatph, in that both are so difficult to get right. And MajaiTei has the perfect balance of all the right ingredients for the perfect Earl Grey and more. When you read Epitaph, you have to have this kind of high quality Earl Grey to accompany you, as you are whisked away into the chaotic world of the Wild West. I still need to read Doc, but it was truly another great book from Mary Doria Russell (loved The Sparrow). And the tea featured is definitely one of my favorite Earl Grey blends I’ve had in the past few months.